Key difference: Fleas are tiny, wingless, parasitic insects that live and feed on blood from humans, dog, cats, and other animals. They are agile, usually dark colored with tube-like mouth-parts adapted to feeding on the blood of their hosts. The bed bug is a reddish brown, oval and flat insect, shaped like an apple seed. They usually live and hide in the cracks and crevices of beds, box springs, headboards and bed frames. The bed bugs usually feed at night when the person in sleeping. Both fleas and bedbugs are parasitic infestation that can often trouble humans: adults and children, as well as animals. Parasites are highly specialized in their nature and are very adaptive to their surroundings, their hosts and their hosts’ mode of life. Fleas are tiny, wingless, parasitic insects that live and feed on blood from humans, dog, cats, and other animals. They are agile, usually dark colored with tube-like mouth-parts adapted to feeding on the blood of their hosts. Their legs are long, the hind pair well adapted for jumping: a flea can jump vertically up to 7 inches (18 cm) and horizontally up to 13 inches (33 cm). Fleas generally have a reddish brown flat body shape. Fleas commonly affect dogs and cats, but may also be found on humans and other available animals, especially if there is no easy excess to the dogs or cats or the cats and dogs have been moved out of the house. Also, the fleas leave a series of bites when they feed. The bites generally result in the formation of a slightly raised, swollen itching spot with a single puncture point at the center, which is similar to a mosquito bite. The bites often appear in clusters or lines of two bites, and can remain itchy and inflamed for up to several weeks. 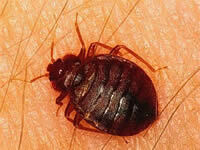 The bed bug is a reddish brown, oval and flat insect, shaped like an apple seed. The newly hatched bed bug nymphs are colorless and have a translucent exoskeleton. They usually live and hide in the cracks and crevices of beds, box springs, headboards and bed frames. The bed bugs usually feed at night when the person in sleeping. The bite of a bed bug is usually red, and often has a darker red spot in the middle. The bites are mainly arranged in a cluster or a line pattern and they may or may not itch depending on the person. Bed bugs are known to bite on the face, neck, arms and hands of the person. Some people might have an allergic reaction to the bite that can include severe itching, blisters or hives. While, both are parasitic infections, there are certain differences between the two. The main difference is that the bedbugs mainly affect humans, but may also affect pets. Comparatively, fleas mainly affect pets but may also affect humans. Fleas move from one host to another, whether they are humans or animals. Hence, fleas are capable of spreading diseases from one host to another. Fleas on rats are in fact credited with spreading the bubonic plague. Bedbugs, on the other hand, are not known to carry any transmittable diseases. Cimex lectularius is the most common bed bug that affects humans. Other species that may affect other animals include, bat bugs, C. pipistrelli (Europe), C. pilosellus (western US), and C. adjunctus (entire eastern US). Most species feed on humans only when other prey is unavailable. Fleas are tiny, wingless, parasitic insects that live and feed on blood from humans, dog, cats, and other animals. They are agile, usually dark colored with tube-like mouth-parts adapted to feeding on the blood of their hosts. Their legs are long, the hind pair well adapted for jumping: a flea can jump vertically up to 7 inches (18 cm) and horizontally up to 13 inches (33 cm). 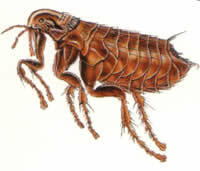 Fleas prefer to live on dogs and cats, but may also be found on humans and other available animals, especially if there is no easy excess to the dogs or cats. Live in cracks and crevices of beds, box springs, headboards and bed frames. Are active only at night. Fleas breed close to the resting and sleeping places of the host, in dust, dirt, rubbish, cracks in floors or walls, carpets, animal burrows and birds’ nests. High humidity is required for development. The larvae feed on organic matter such as the feces of the host, small dead insects and undigested blood expelled by adult fleas. The adults go out in the night and feed of the blood of humans or animals. Breed in cracks and crevices of beds, box springs, headboards and bed frames. Dwellings can become infested in a variety of ways, such as: bugs and eggs inadvertently brought in from other infested dwellings by visiting pets; or a visiting person's clothing or luggage; infested items (such as furniture, clothing, or backpacks) brought in; nearby dwellings are infected; wild animals may introduced bugs or eggs in the dwelling; people or pets visit an infested area (such as an apartment, subway, movie theatre, or hotel) and carry the bugs back. The flea species does not usually remain on the person after feeding and by day it rests in cracks, crevices, carpets and bedding. Hence, it can be hard to find and to pin point a flea infestation. Also, the eggs can hatch after weeks of being laid and start the infestation anew. Bedbugs are usually active at night and early morning, when its prey is sleeping heavily. The bulk of the activity usually takes place between 5 am and 6 am. They feed for 3 to 10 minutes then leave to hide. During the day, they hide in cracks and crevices of beds, box springs, headboards and bed frames. They may even hide in floorboards, walls and neighboring rooms. They can travel very fast. Hence, it is often very difficult to pin point an infestation. Many even attribute bedbug bites to rashes and allergies, as they often do not find the bedbugs. Their bites can cause irritation, serious discomfort and loss of blood. Symptoms appear a while after Red bumps, often with a darker red spot in the middle, may or may not itch. Severe symptoms may include hives, severe itching, small bumps that itch and may bleed, and/or allergic reactions to flea saliva resulting in rashes and/or impotence. Severe allergic reaction may include severe itching, blisters or hives. An effective repellent applied to skin and clothing, prevents fleas from attacking for a few hours. Dusting clothing with insecticide powder, or by using insecticide-impregnated clothing, keeping houses well swept and floors washed, treatment of floors with detergents, insecticides or a solution of naphthalene in benzene, and spraying or dusting insecticides into cracks and crevices, corners of rooms and areas where fleas and their larvae are likely to occur. Wear covering garments while sleeping, pesticide permethrin on mosquito netting may keep them as bay. Treatment includes oral antihistamine, such as diphenhydramine (Benadryl), skin cream containing hydrocortisone.